At the beginning, we wanted to make a movie about everyone we had filmed during the three months and 140 hours of tape we shot in the African country of Mali, because each character in BURNING IN THE SUN is so fascinating and vibrant – from the sole female schoolteacher Olga Sidibe in Banko village to Dr. Richard Komp, the mad scientist who acts as Daniel’s mentor in the film. After months of editing, it became clear that Daniel Dembélé—passionate, complex, and commanding onscreen— was to be the main focus, and that his story could best encompass the issues we wanted to delve into in the film. Some of the most valuable feedback we got while crafting this film was from our editor, Emily Paine. She encouraged us to trust our material and not try to make anything fancy, fabricated, or to insert any “big drama” that did not otherwise naturally emerge. So the BURNING IN THE SUN story thrives on its own organic elements and characters. We also didn’t want the film to be dogmatic or preachy. We wanted viewers to feel safe with the characters and the situations we presented, and to have the space to approach the material from their own perspective, without being told what to think. Founding a small business is something that is deeply embedded in American and European culture. But most have never seen this universal kind of effort take place in Africa, traditionally portrayed by mainstream media as a land of the starving and war ravaged. In our portrayal of Daniel, who undertakes a familiar effort in an unfamiliar environment, we attempt to open the door to on what is viewed as possible in Africa, and update Western cultural awareness with a profound dose of optimism. Daniel’s work shatters notions of the need for African dependence on outside aid and embraces the view that ultimately it is Africans who will develop Africa in their own way. Now more than ever, people around the world see green-collar jobs as a necessity for survival in our rapidly changing economies and environments. Daniel’s daring, charisma and intelligence remind us of the leadership required to encourage this level of transformative change, anywhere in the world. We showcased Daniel as an African leader, as well as a global trendsetter. We think this allows viewers to understand the kind of micro business development that makes sense for Africa, while also hopefully stirring a profound inspiration to take action in their own communities. Throughout the film, expert interviews and voiceover narration are omitted in favor of giving space to both Daniel and the people of Banko to tell their own story, in their own words. Visual contrasts, like a bright blue shiny modern solar panel resting on the ground of a pale brown dusty village, confront a viewer’s preconceptions about solar energy and about Africa. Scenes shot in natural sunlight and total darkness work to place the viewer in the characters’ shoes. The original score combines emotional orchestral sounds with modern R&B swagger and traditional Malian folk music to sonically reinforce the idea that something utterly new and original is taking place. Handheld camerawork emphasizes Daniel’s infectious energy and constant movement forward, while serene shots of rural Mali’s slow, small-town pace contrast with Daniel’s kineticism and the urban chaos of the capital. 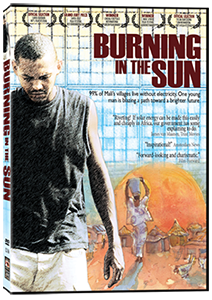 BURNING IN THE SUN is often labeled as a film that is ‘African’ or ‘Environmental’, but our goal is to desegregate these two topics, and to encourage disparate conversations to join together in dialogue, and start a new discussion on the world stage. Strikingly beautiful, surprisingly emotional, and a revolution of ideas, the film provides a new school portrait of a Green Africa capable of inspiring worldwide emulation.